Go Anywhere Morphing Quad — This drone can change its size! This drone can assess gaps and shrink to squeeze through them, while in flight! Researchers at the University of Zurich and EPFL designed an aircraft using 3D printed parts and off the shelf motor and radio system, and it can literally fold itself to fit through gaps, making it ideal for search and rescue and other scouting missions. PhD candidate Davide Falanga explained, “The idea came up after we worked on quadrotor flight through narrow gaps. 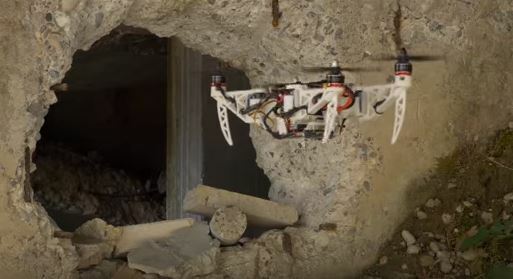 The goal of our lab is to develop drones which can be in the future used in the aftermath of a disaster, as for example an earthquake, in order to enter building through small cracks or apertures in a collapsed building to look for survivors. Our previous approach required a very aggressive maneuver, therefore we looked into alternative solutions to accomplish a task as passing through a very narrow gap without having to fly at high speed.